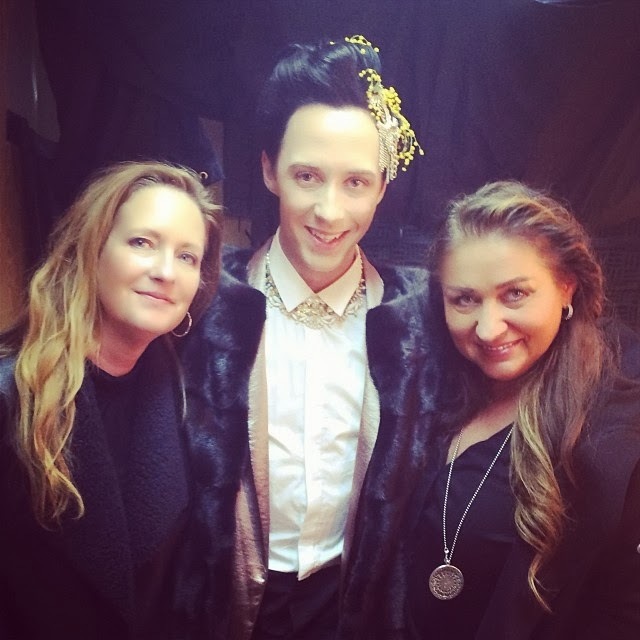 Binky's Johnny Weir Blog Archive: "Be Beautiful and Speak Well"
Johnny at one of the men’s practices in Sochi. “Watch us tonite on Chelsea Lately! Visit Johnny’s official website for a schedule of all his upcoming TV appearances! Piecing together exactly what he’s doing when has been an intriguing project the last 24 hours, with info culled from various sources because yesterday was a total explosion of Johnny media, which you can catch up on here. As noted above, he’s scheduled to appear on an Access Hollywood segment today and on Chelsea Lately tonight. Of course “scheduled” means that it could totally not happen, but set those DVRs anyway just in case! UPDATE: The Access Hollywood segment has been moved to Friday. They’re also scheduled to be on Access Hollywood Live on Friday. 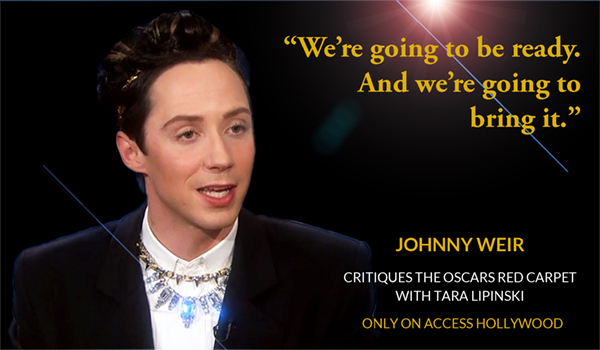 See all the broadcast details on Johnny’s official website! I believe he’ll be doing additional Access Hollywood and/or Access Hollywood Live segments leading up to the Oscars on Sunday (yes, those are two different parts of the same show. IDK. Here’s their website. Good luck). 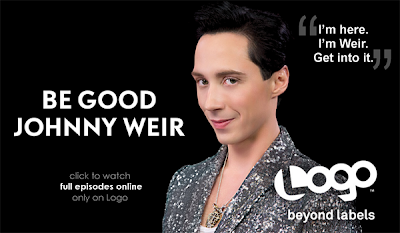 Weir and Lipinski will provide fashion critiques of the celebrity-studded Academy Awards from a tower posted above the red carpet, the entertainment show confirmed Tuesday to TODAY.com. They also will be featured on Access Hollywood Live and taped episodes later this week, as well as on Monday’s shows, which will include segments recorded at the Oscars on Mar. 2. The fashion-forward onetime Olympians will be posted in a tower position above the red carpet, where the program’s veteran host, Billy Bush, will be interviewing Academy Awards attendees. As with Bush, viewers won’t see Weir and Lipinski on Sunday; instead, they will appear in Monday’s two “Access” episodes, including segments taped at the Oscars. Their stint will kick off with a special “behind-the-scenes” look at their Oscars-outfit shopping excursion (someone needs to wear those Rodarte Star Wars dresses, Tara), which will be, in other words, Christmas morning. On the big night, March 2, the two will be posted in a tower like the princesses they are, commenting on red-carpet fashions while Billy Bush interviews celebrities. 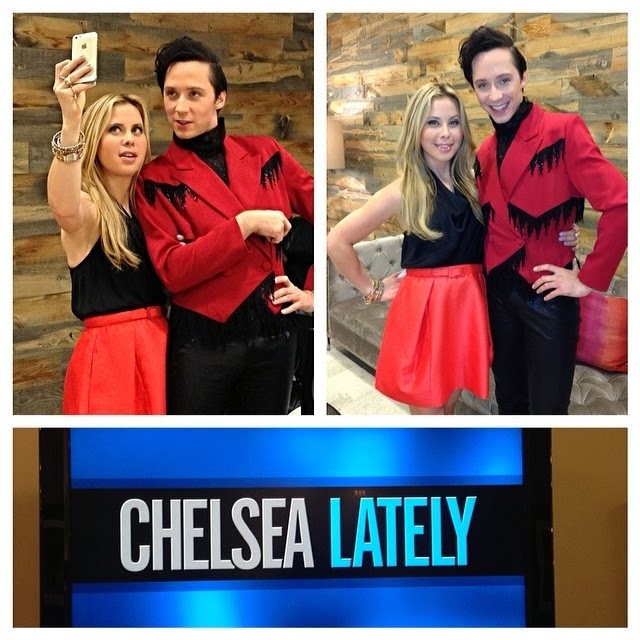 @taralipinski & @johnnygweir as they visit #ChelseaLately. 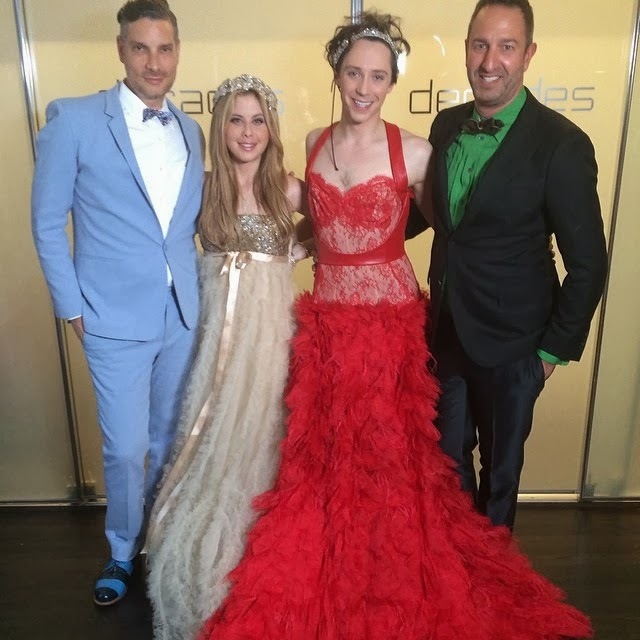 Via Decades Inc: “We guarantee Gold on the Red Carpet! but are you ready for us?! Yes, it’s all in Russian. And even though I only understand maybe five words of the language, I love to listen to Johnny speaking Russian. But fortunately we don’t have to settle for a beautiful but incomprehensible (to most of us) 20 minutes of Russian that shall forever remain a mystery. The lovely Tatiana Edrenkina has once again rescued us with a translation that we’ll present here in two parts, with our deepest gratitude to Tati. 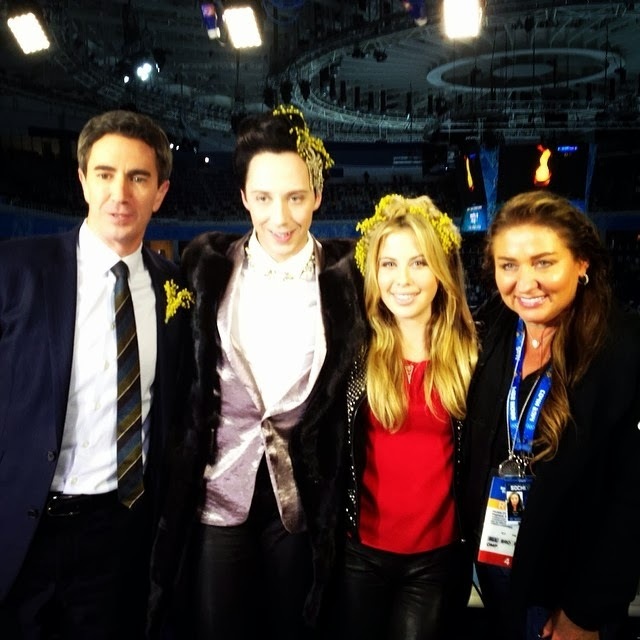 Vasily Solovyov: Johnny, I know that you’ve been working for American TV as a duo with Tara Lipinski. VS: You have such a dynamic. Very cool duo. You’ve been posting all your photos and videos on Instagram and it’s really funny. Was it you yourselves who decided that you should work as a duo, or was it NBC who invited you to do so? JW: It was NBC, of course. I have never competed with Tara, and we’ve never been in a show together. We were only acquaintances. She’s a very funny girl, very good, smart. It’s very comfortable to work with her because we want to work and be like stars on TV, and I think that everybody in the USA is very happy that we’ve done a good job. VS: I’m sure of it. Please tell me what your work consists of. 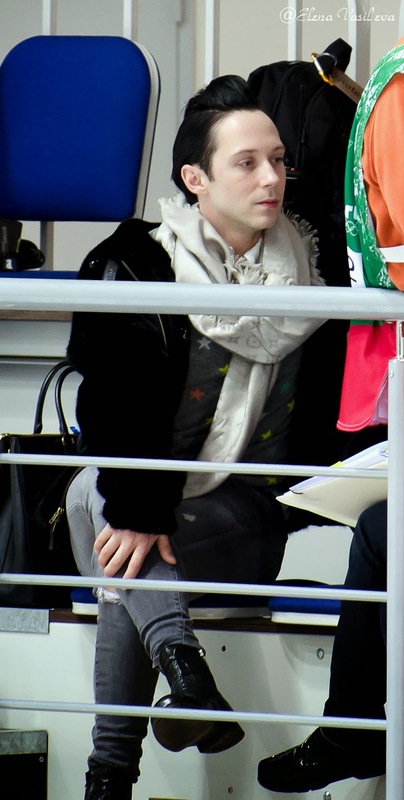 You know, to the right of me in the commentating booth there are Canadians, Kurt Browning together with two girls. They have editors, producers, assistants. I often see Kurt in the morning giving interviews or playing a harmonica. What about you? Do you work just on air, or do you do anything else, like writing or doing TV reports? JW: Well, there are a lot of different people on NBC who can do what I can’t do. They visit practices every day, they write all the skaters’ bios for us. For us, it’s just be beautiful and speak well. This is our job. We give a lot of interviews and we live like little stars. This is a very beautiful job for us because we can talk about a skater not only as an athlete, but as a person. That is very important to me, because I often sat and watched videos of my skating and I heard them saying wrong things. JW: Yes, ours. You were always good. You’re a good guy. Thank you for that. VS [looking at the camera]: All of you, did you hear that? JW: Galina Yakovlevna used to scream: “Umnitsa, umnitsa, just like Vasya said!” And I was always very happy. I never wanted to watch my YouTube videos from NBC, only from NTV+. You were perfect. VS: This interview is not about me, it’s about you! So you’re trying to say nice things about all skaters, right? JW: Yes, nice things, never bad things. If they skated really badly with a bad attitude, you should say how difficult figure skating is. This is art, this is sport. Every skater has a good moment, and you should talk about that. You shouldn’t destroy them. VS: Johnny, in our country we now have a very difficult situation. We have a very good skater—I think you’ve heard about him: his name is Evgeni Plushenko. 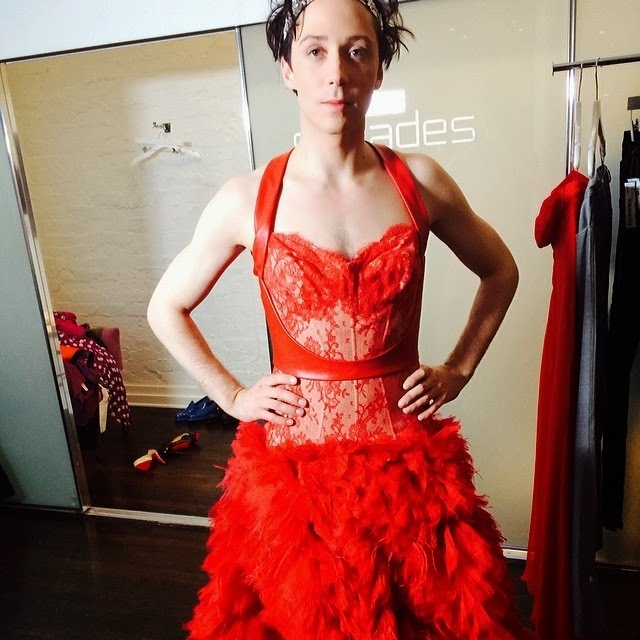 He withdrew from the competition, and a very serious discussion began that he is a bad person because he should have skated, he should have killed himself, and he should have broken all his bones but he should have represented our country until he became an invalid. What’s your opinion about this situation? JW: Plushenko has always been my friend and he’s always supported me at competitions. After Vancouver he told me: “Today the judges dislike Russians, you and me.” He’s always been good to me. As an athlete I know that if I want to skate, I can, but if my body doesn’t want to skate, it’s impossible to skate. 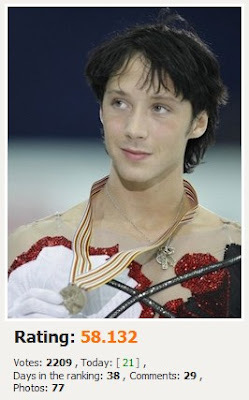 And I believe that Zhenya skated like God at the team event and he did perfectly for Russia. But if his body said no, then the body said no, and he couldn’t skate. And it’s unfortunate that he couldn’t skate because he’d have gotten a medal 100%. VS: Didn’t you in America laugh at us when this situation happened? Because he came here instead of… well, another guy had won the Russian Nationals and Evgeni had lost to him, but then he came here and couldn’t skate at the end. Didn’t the Americans laugh at us for that? JW: I don’t know. In America we have another situation, very political. VS: Can you get onto your national team if you haven’t won the Nationals? JW: It’s impossible to say, “I’ll be at the Olympics!” if the federation doesn’t say that it’s possible. But Zhenya is a legendary skater. If he wants to skate, let him skate. VS: Johnny, you have a very kind heart. 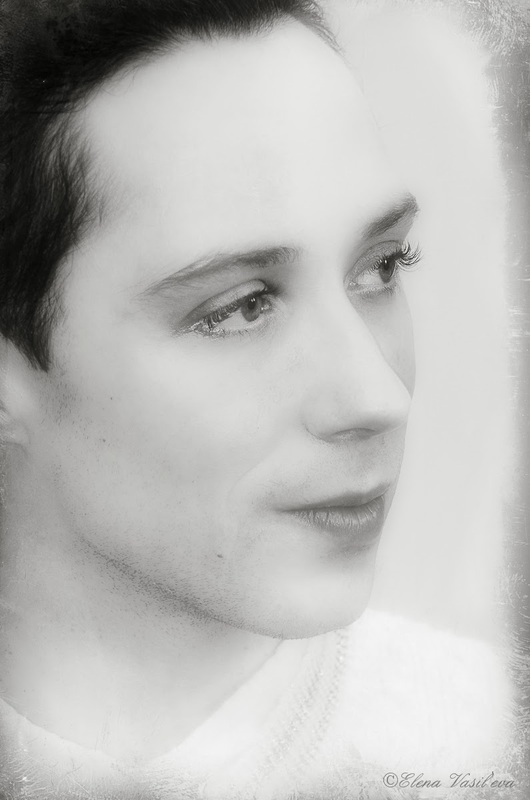 JW: Maxim Kovtun is a good guy. 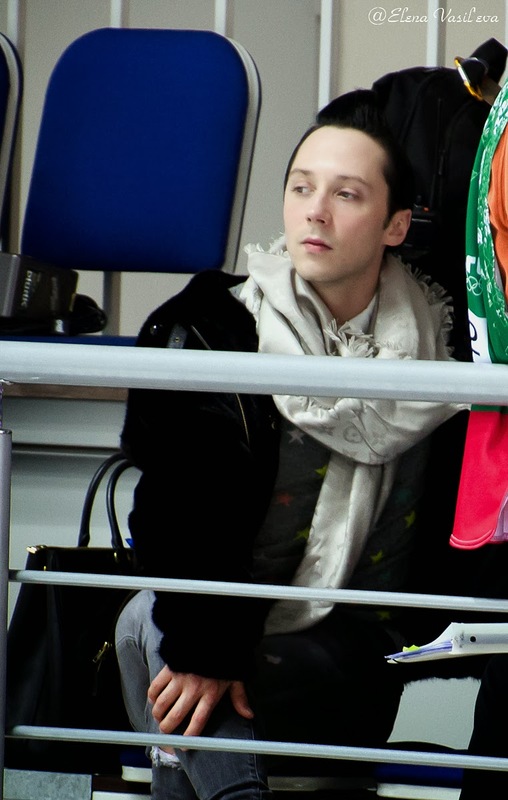 He did three quads in his free program, and that’s very beautiful. Of course, he’s the future. Maxim will become a champion, I believe. But at these Olympic Games, I wanted Plushenko to skate. VS: So if he wasn’t here, that would make you sad? I understand. OK. Can I ask you about our hockey players? JW: Poor guys. We were sitting together in the NBC compound yesterday watching this match. I’m so sorry that Russia didn’t win and that there wasn’t a medal for Russia. I always wanted the gold medal either for Russia or for the USA. I always support Russia, you know. But what can you do? It’s a sport. It’s very difficult to perform for your own country. Another from the series by USA Today. Bonus pic: One more from men’s practice. without whom today’s post mostly would not exist!